Are you a stress eater or a stress baker/cook? I tend to be a stress baker. When something falls out from under me and it’s really bad, I tend to run into the kitchen to get some control back. Last Saturday morning was one such morning. I went to bed miserable and woke up to find nothing had righted itself. When I realized there was nothing I could do, I ran into the kitchen and start breaking eggs, slicing pears and getting out the brandy. 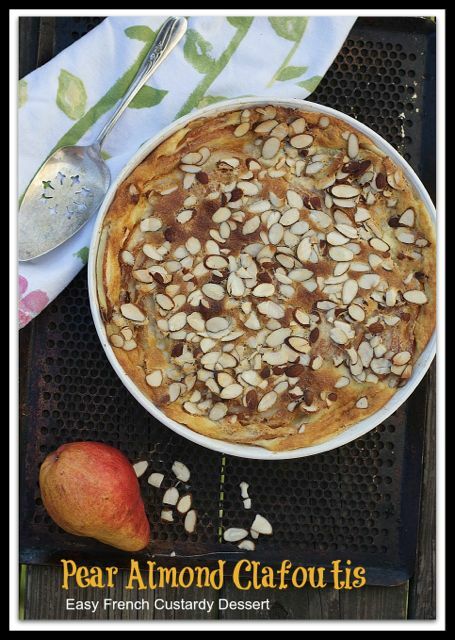 I discovered this pear almond clafoutis over at one of my favorite blogs, Taste Food. Everything that Lynda prepares, I could eat and I’m a bit picky. I feel like she cooks the food I would want my personal chef to cook. The Pear Almond Clafoutis is Rustic French Food with Sophistication. It’s a bit elegant, a bit rustic, and a whole lot beautiful. I’ve made peach clafoutis which I won a cooking contest for and cherry clafoutis, but her presentation swept me and I tried her recipe and loved it. As I slid the pear and almond clafoutis into the oven, I told my husband to take it out when the timer goes off, because I needed to go on a run. When I came back, it was ready to photograph. It smelled heavenly and I needed that piece of heaven to help with my disappointment. It was a site crash and I won’t bore you with why it was just the wrong day for that to happen. Life is fragile. We can be let seriously let down by technology companies, or attacked by a virus we didn’t see coming. I try to make the very best of every day, not losing patience, not complaining, trying to be a force for good, moving with gratitude and trying to stay a bit in awe of the wonderment of life, and the good God provides. Finding beautiful blogs lets me know there are other people in the world that put their heart into food and the time to make it pretty. Life has rough edges and needs those willing to soften it, give it ruffles. Lynda doesn’t know how much her recipe helped to brighten my day and make it a better place, and I hope I can return the favor sometime. I left the pear skins on and generously buttered the pan. 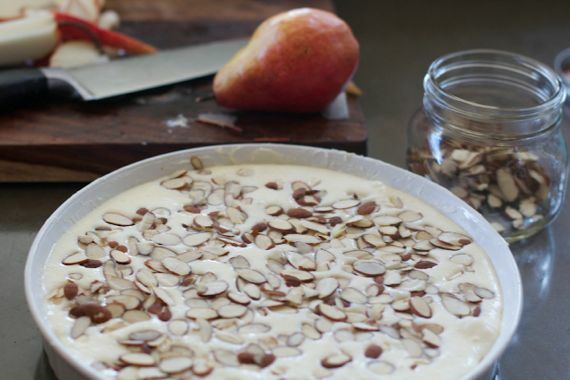 Pear and almonds are a beautiful match together. Add heavy cream and eggs to the mix and it’s a lovely french dessert. 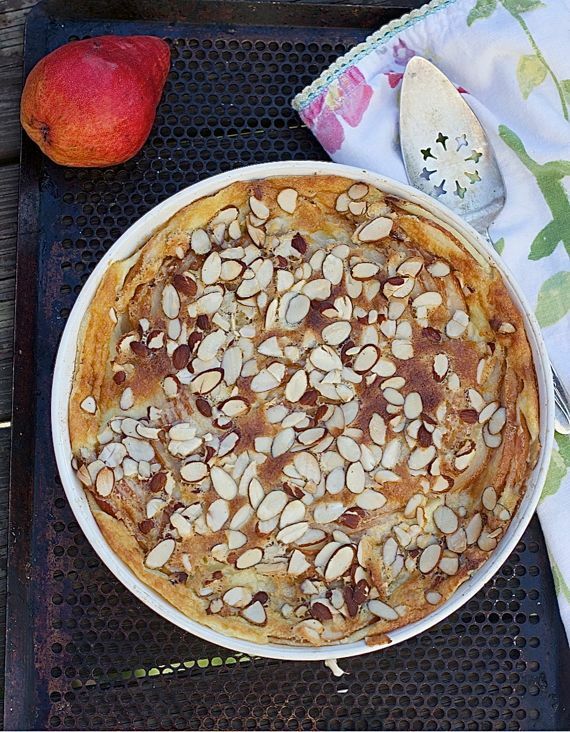 Pear and almond clafoutis can also be served at brunch or breakfast. In fact, this would wonderful to serve at Christmas breakfast. It’s almost like a sweet fruit quiche. It passes the easy to make, yet elegant to look at, delicious to bite into test. So tell me, do you run to the kitchen to eat when you stress, or do you start banging pans and turning on the oven? If you like this recipe, you’ll probably love our apple dutch baby. Adapted from Taste Food, this is an easy, elegant french dessert that is perfectly okay served for breakfast too. Preheat oven to 375 F. Butter your baking dish. Slice pears, thinly. I left skins on as the pears were very ripe. I mixed everything in my vitamix, but you can mix in a kitchen aid or beat with electric mixer. Beat the eggs and sugar for minutes. Add flour, cream, milk, vanilla and almond extracts, salt and brandy. Blend on low to thoroughly mix. 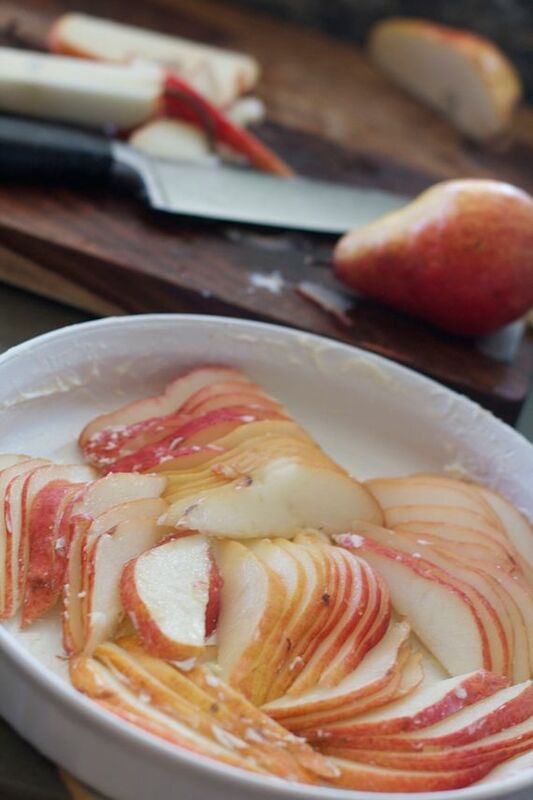 Arrange the pear slices, slightly overlapping. Pour the custard mixture over the pears. Sprinkle with the sliced almonds. Bake until the top is golden and the custard is set, 30-40 minutes. Remove from oven and cool on a rack. Serve warm, cold or at room temperature. Just made this for Christmas day munching. OMG! We’re all loving it. I am glad you are back…I like the name I just wish I could pronounce it…sounds delish! I love clafoutis! I’ve never tried it with pear and almond though. It sounds delicious!! Perfect for #nutlove! Thanks for joining in! Hi Angela, I wondered if something had gone wrong as the badge didn’t arrive… and then I had to go to a yoga retreat Fri-Sun which was also a digital detox so I couldn’t post anything, anyway. Ah technology – it’s sent to fry us. The clafoutis looks beautiful. I’m a big fan of pear and almonds combined, and with dark chocolate, let me tell you, it’s a match made in heaven. Pear, almond and choc fudge cake is one of my specialities. Hope you’re feeling more chilled out now, and thanks for sharing this lovely recipe. I will make it over the weekend. I am so happy this recipe cheered you up! And thank you for making my day with this generous link! This recipe would have cheered up my day as well Angela, although I would have eaten more than my share if stressed.